Adding a second screen to your PC can bring several benefits, whether it’s giving you more space to work or, for the YouTube and Twitch crowd, the ability to read web pages while you game. Finding room in your budget for one, however, is often much harder, especially if you’ve already spent a lot on your first monitor. Enter the AOC E2470SWH. At just £105, this 24in, 1920×1080 TN panel is one of the least expensive ways of adding a bit more real estate to your current screen setup. It’s pretty straightforward and doesn’t include any fancy features like AMD FreeSync or a high refresh rate, but at this kind of price, I wouldn’t expect it to, either. I’m not going to lie, the E2470SWH’s image quality isn’t fantastic, but it’s not terrible either, covering 86.9% of the standard sRGB colour gamut once I’d calibrated it with my X-Rite i1 Display Pro. To give you an idea of what that figure translates to in practice, colours were more or less in the same ballpark as my AOC Q2770PQU reference monitor (they weren’t hideously green or overly blue, for instance), but the panel’s bias towards the cooler, more neutral ends of the spectrum meant images on the E2470SWH lacked the same kind of warmth and vibrancy. This wasn’t helped by a relatively high black level of 0.36cd/m2 (the closer it is to 0.0cd/m2, the better), but to be honest, this is pretty standard stuff for a cheap TN screen, so on the whole it’s not really that surprising – it’s just the TN monitors I’ve been reviewing recently have all scored above expectation. It’s plenty bright enough for everyday use, too, with a maximum brightness level of 240cd/m2. Again, not spectacular, but you’d start straining your eyes if you looked at anything much higher for any significant length of time. What did raise an eyebrow, however, was its rather disappointing contrast ratio of 541:1. This is around half what I’d normally expect to see here, and the effects were plain to see. Areas of shadow, for example, were lacking in detail, showing patches of grey instead one smooth gradient, and vertical viewing angles were particularly poor, resulting in a visible colour shift whenever I moved my head up and down. This is a shame, as it means the E2470SWH’s generous amount of back and forth screen tilt is completely wasted, as darker areas of an image just turned completely black when I pushed the screen back while brighter areas became noticeably gloomy. Turning its contrast setting up didn’t help much, either, as whites and light areas of the screen just turned into a single crushed mess. On the upside, I couldn’t see any evidence of backlight bleed, where the underlying LEDs leak through to the main image, and its varied selection of ports give it plenty of flexibility. 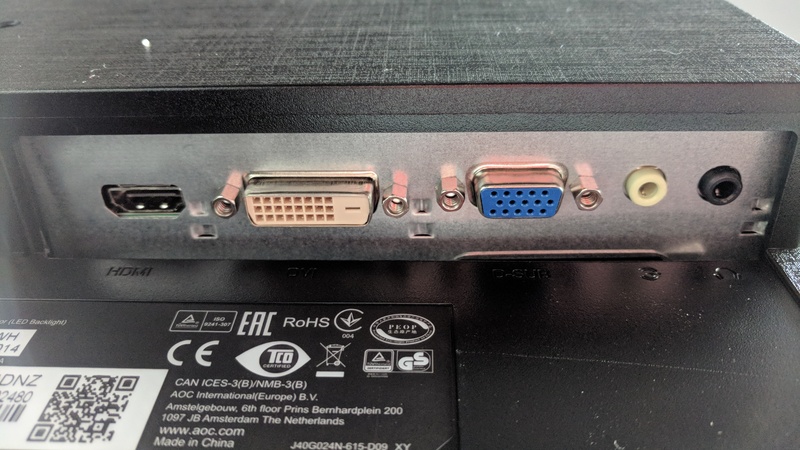 There’s no DisplayPort, but you do get VGA, DVI-D and HDMI, plus a headphone jack and an audio line in. On its own, the E2470SWH would be an all right purchase for those after a cheap second screen. However, when you square it up against AOC’s marginally more expensive G2460VQ6, which costs around £135, the E2470SWH just can’t compete. Not only does the G2460VQ6 comes with a much better, more accurate panel, but it also has AMD FreeSync support to help your games appear smoother if your graphics card isn’t quite up to the task of running things at the highest frame rates. 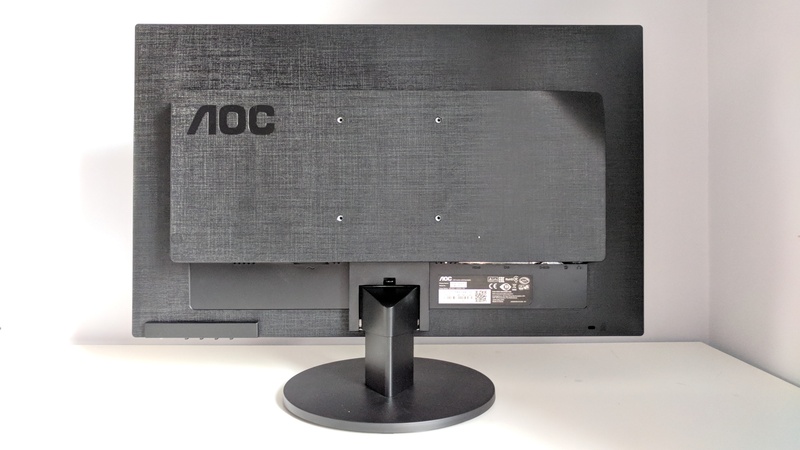 There’s also AOC’s G2460PF to consider (our current pick for best gaming monitor at 24in), which throws in an equally excellent panel plus an adjustable stand, more ports and a higher refresh rate for just a little bit more at £217. If your budget’s strictly limited to the £100 end of the spectrum, though, then it’s the G2460VQ6, not the E2470SWH, that should be top of your consideration list. Tagged with AOC, feature, Hardware, Monitors.